The last few weeks, I haven't been stellar in the kitchen. I've tried several new recipes and not a single one was anything the family wanted to finish, let alone have the leftovers. It was very depressing. I don't like having the same things all the time! 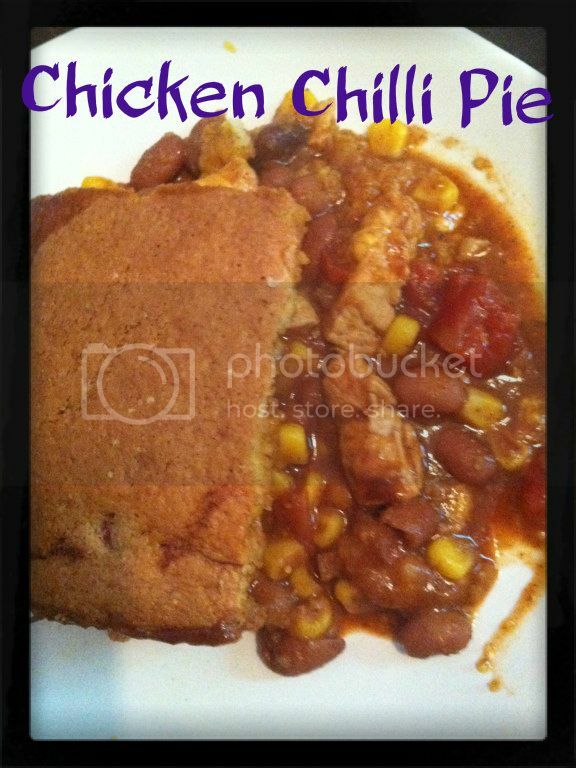 Back in April, I pinned a recipe from Jane's Adventures in Dinner for a Chicken Chilli Pie. Anyhoo, I figured it was time to try a recipe I was sure was going to be a sure thing...with a few tweaks. The recipe has a great foundation: Chilli and cornbread. What can possibly go wrong? And for the record, the only thing that went wrong was me not making enough! It was a HUGE hit! I started with her basic chilli recipe and tailored it to our family's tastes. We like a bold chilli flavor. I also like to add veggies to anything I can. Chilli is a fantastic way to get the extra veggies in without making it obvious. The Boy has some texture issues and will only eat corn mixed in to things like mashed potatoes and chilli. In a skillet saute the onion and garlic in oil. Add seasonings and chicken. Cook until the chicken is done. Then add the beans, corn, tomatoes, tomato paste and heat through. Spread in a 9X13 pan and top with cheddar cheese. Prepare the cornbread according to the directions, then spread it on top of the cheese. Bake in 350 oven for 20 minutes (40 if you use two boxes of cornbread). This sounds so good! Making me hungry! Chicken and chili...what a great combo! Stopping by to say I am so glad you are joining us for the Bloggy Olympics! It's going to be a great time! Mmmmm... I do love Jane! Glad to see you at the Bloggy Olympics! This looks delish! And I'm sitting here waiting for dinner. Thanks so much for stopping by Creative Thursday last week. I couldn’t do these parties without you. Can’t wait to see what you link up this week. Have a great week. This looks like some serious comfort food - yum! Thanks so much for sharing at Mom On Timeout!